(By Yogesh Sarkar) It is nearly 4 in the morning and I am standing at a rain-soaked Haldwani bus depot, wondering what to do next! 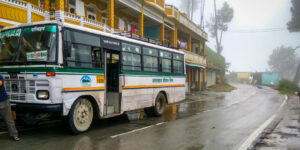 I had arrived here without any planned itinerary in a UTC Delhi – Haldwani AC Bus, hoping to randomly pick a bus from the station and travel wherever it maneuvre me. However, I am late! All the buses traveling to Kumaon have left. Only a couple of buses to Almora and a Delhi – Dharamdhar bus are parked. I didn’t want to travel to Almora or take the Dharamdhar bus to Baijnath, Bageshwar or Kausani as, I have already been to these destinations. I walk over to the information counter, hoping to find a bus to Pithoragarh. But there are none. The last bus left at 2:30 AM and just as I was wondering what to do next, Delhi – Bansbagarh bus arrived at the depot. I had taken this bus last year and although its last stop is Bansbagarh, it never reaches and instead finally halts at Nachani. I board the bus and the conductor remarks that they aren’t sure, if they will actually even make it to Nachani, since landslides are quite frequent these days. He issues me a ticket for Thal, which is fine with me since Thal has quite a few temples that I would love to photograph, while Nachani is just a small town by the roadside with nothing much to capture except a Shani Temple. The bus begins its journey to the Himalayas, just as the monsoon rain starts showering us with love. Haldwani is shimmering below in the valley, looking beautiful with the rain and the dark clouds above. One can faintly make out the mountain silhouettes in the distance. As the storm rages outside, my inner storm calms down. This is one of the reasons I love to travel to the hills! It has a calming effect on my soul and enables me to think clearly, thus helping me reconnect with the inner self. I like to term this as – my search for the unknown. The conductor is busy over the phone, worrying that the road to Almora might be closed due to landslides. At 5 AM, we reach a beautifully drenched Bhowali. As we pull into bus station, it becomes all too apparent that we will have to take the alternate route via Ramgarh to reach Almora, whose road might get closed soon too. 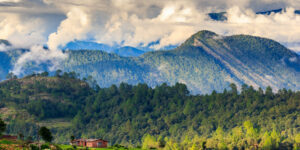 Though I always found Kumaon enchantingly beautiful, today her beauty seems intoxicating and wild! There is ferocity in her demeanor today, enough to keep the locals on their toes. As for me, it all seems like a dream. As we take the narrow and longer route to Mukteshwar and continue on to the journey, visibility comes down considerably due to the heavy rain and the clouds engulfing the road. We encounter a few landslides too. To my horror, water started entering the bus through the ventilation system, forcing me to switch from the window to the aisle seat. A couple of hours later, we make it back to the main highway and reach the usual pit stop before Almora. Thankfully rain is almost down to a drizzle which made way to much needed nourishment in the form of a Kumaoni breakfast consisting of black chickpeas, boiled potatoes and cucumber raita, along with tea. Our bus, drenched in monsoon and even leaking inside, looks a lot more appealing than any luxury bus I have ever seen. Since we are running late, the conductor is already making an excuse for not going to Thal. He does not want to go there, and instead is charging extra for taking the longer route. As we enter Almora, it begins to rain cats and dogs. The bus was leaking so much so that the conductor had to abandon his seat and sit in the front. Thankfully there aren’t many people in the bus, so people can change seats. But we can’t move away from the flowing mountains, with numerous rivulets flowing on the road. All bets are off now. If it continues like this, there is a good chance we could get stuck on the road due to a landslide or worse still, be under one. There is no telling, how far and long the journey is going to be. But I enjoy the uncertainty! The valley is bestowed with beautiful lining of clouds. Everything is thoroughly soaked in the life-nourishing liquid, which can also end our lives any time. Finally the rain stops, just in time. Yet it is still cloudy, wet and beautiful outside. Around noon we reach Seraghat. 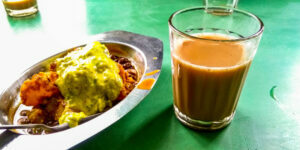 I am hungry and it is time to eat at one of my favorite roadside dhabas. Things have changed since last year; the food is no longer good, prices have gone up and a thali now costs Rs. 60. Soon other passengers board the bus as well, complaining about the quality of food. Apart from me, there is one more passenger who has to go till Thal. Everyone else gets off at the few villages enroute. Successful at convincing that it is unsafe to proceed to Thal, the conductor plans to drop the two of us at Udiyari Bend and help us hire a shared taxi to Thal. He would be heading to Bageshwar, where lodging etc. is better. As we drive towards Udiyari Bend, I see a mile marker mentioning Chaukori at 6 km. I ask the conductor if Chaukori is en route or away from the route to Udiyari Bend. “Don’t you have to go to Nachani?” he asks. “I am on a holiday, so I can go anywhere. Right now Chaukori looks interesting.” The conductor smiles. He is taking the road to Bageshwar from Udiyari Bend and Chaukori falls en route. He assures to drop me at Chaukori before proceeding further. Once we reach Chaukori, the conductor asks the driver to drive till the gate of KMVN Chaukori (only a hundred feet away) and drops me right there. After bidding each other farewell, I head into the KMVN Guest House. The Nachani bus has been special to me for the third time in a row. On the first occasion, it had stopped at an ATM for me to withdraw money, next it had waited for my arrival to start from Nachani, and now the bus itself had come to Chaukori to drop me off! The cheapest room at KMVN Chaukori is for Rs. 990 a night including breakfast. Since I am the only guest at the hotel, I take my pick and check into room 004. It is raining outside and makes the KMVN seem more refreshing than it actually is! I sit back and relax, watching the clouds obscuring everything. And then in an instance, the cloud shifts to reveal the cottages in front. Not satisfied with watching from the inside, I take out my umbrella and venture outside. Dinner is a simple affair of roti and egg curry, but it is delicious! Meanwhile, it was drizzling nonstop and with nothing to do I finally decide to go to sleep at around 2 AM. I wake up early in the morning to go back to sleep again on seeing that it was still raining outside. Breakfast is served at 8, consisting of a large delicious parathas with an omelet. I remain in my room till 10 AM. When I step out of my room, Chaukori looks beautiful with a thick blanket of clouds still covering the horizon and the KMVN cottages fitting perfectly in that view. I climb the watchtower at KMVN for a better view. Even though I can’t see much, but whatever I can see is heavenly! Clouds reveal the distant homes and mountains for a few seconds, only to engulf them again and hold the mystery in their bosom. After lunch, with my camera gear safely tucked away in my LowePro Flipside 400AW camera bag, I decide to sit outside on the bench and enjoy the rain. 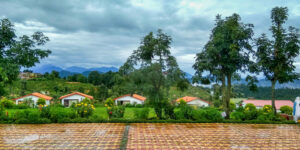 Nothing seems more relaxing than sitting in a light drizzle in the mountains or perhaps with a cup of tea in hand. By evening, the play of clouds has become more and more interesting, even though not a single peak is visible yet. Not one to complain, yet I wanted to see all the peaks visible from Chaukori. Later in the day when I am standing at the watchtower, a family checks into the KMVN guest house and decides to take one of the cottages. Apart from me, they were the only guests here. That family too decides to settle into one of the benches, hoping and waiting for clouds to abate, in order to watch the beautiful Kumaoni peaks. I wanted to see what God had brought me here for. So I close my eyes and ask him. I open my eyes, and look around, waiting for the magic. But magic happens, when you stop looking and start believing. In the distance, there is something white and bright. It is too white and angular for a cloud. So I zoom in with my three-legged horse (Canon 55-250IS). It’s a peak, and slowly the clouds parts way from it, making it appear as if the peak is floating in the clouds in a lost horizon. I am excited! So is the family sitting next to me. A few minutes later, the peak disappears. I think it is Nanda Kot, but it isn’t. It is Yudhishthira Peak of the Panchchuli Range. I am disappointed, I have already seen and photographed Panchchuli and I wanted to photograph the mighty Nanda Devi. The illumination of light was getting low as it is well past 7 PM, yet the hide-and-seek magic continues. More peaks from Panchchuli Range are beginning to make their appearance and in the distance, clouds begin to reveal Rajrambha as well! Slowly and steadily, all five peaks of Panchchuli Range and Rajrambha reveal themselves. There are beautiful hues in the sky and even though it is 7:30 PM, there is still sufficient light! With such dramatic colors and clouds appearing on the horizon, I cannot describe what I am seeing in a single photo, so I set up my camera for another time lapse. I ask the KMVN staff to watch over my camera, while I quickly run inside to fetch my sweater. Temperature is 19 degree Celsius. With winds, it feels colder. Yet I do not wish to retire to my room, even though the light is gone. 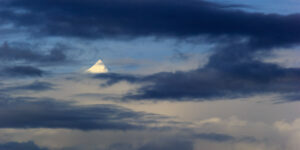 I am hoping for the clouds to part again and for peaks to be illuminated by the moon. Nevertheless, it is time to shoot a little more, even if there is cloud cover. Around 8:30 PM, I go back to my room and have dinner. I plan on getting up at 4 AM, in the hope of getting a clearer view of the mountain ranges. I hop into my bed and switch off the lights and open the curtains, my room is now bathed in moonlight and I sit there thinking. I fall asleep, with a smile on my face at last. At 6:15 AM, I leave my bed and go outside. The weather is beginning to clear, but not on to the side of Panchchuli and other peaks. On the left-hand side, I can see clouds parting a little and a range briefly visible, I am not sure if it is Trishul or Nanda Devi, however, it is there for a brief moment and as soon as I take a photograph, it disappears. I ask the KMVN staff to bring the tea where I was sitting. It was serenely beautiful and I was finally at peace. I wanted nothing more than to sit on the bench, enjoy the cup of tea, being refreshed to the core! After breakfast, it is time to leave Chaukori even though the weather was getting clear. But it is time to head back home as I got what I was looking for. Around 9 AM, I check out and walk towards the police check post to wait for the bus to Bageshwar from where I can get another connecting bus to Haldwani. I wait for an hour, but there is no sign of the bus. The cops suggested me to go to Berinag instead as there is no guarantee I will get a bus at Bageshwar since the road could be blocked for heavy vehicles. I decide to take their advice and got a shared taxi to Berinag after 15 minutes. Slowly and with plenty of breaks, we make our way to Berinag and I get off at the fork after paying the fare of Rs. 30. I spot a couple of cops in the distance and ask them about the bus to Haldwani. While one recommends a shared taxi, the other asks me to wait as a bus from Dharchula normally arrives around noon and I could take that. I take his advice although it meant me having to wait for over an hour since it is only 11 AM. Around 12:30 PM, I see the Dharchula bus approaching and quickly board it and boarded. There are only a handful of passengers and it doesn’t stop at Berinag. At the beginning of my journey, I was planning to take this bus from Haldwani, and as fate would have it, I am taking it now for the journey back to Haldwani. Initially, I planned to take a Volvo from Haldwani to Delhi, but I change my mind and ask the conductor to issue me a ticket till Delhi. It costs me Rs. 570. I settle into my seat and got lost in my thoughts. Sun is out and it is hot outside; inside the bus, it’s comfortable. 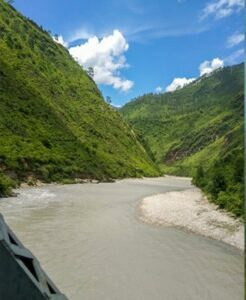 Crossing the bridge over the Sarayu River at Seraghat, I am reminded of how wild the river looked on my onward journey to Chaukori and now how serene and beautiful it looks now. Getting off at Seraghat, I am in no mood to eat at the usual restaurant and approach a newer one and ask for a veg thali. Roti, mix dal, saag, curd, and onions make up the thali here and it is delicious, especially the saag! After I finish my lunch, I am served mango as a sweet dish! I guess this means this thali is going to be more expensive than the one at the restaurant next to it. Only, it isn’t! It is just 30 bucks and that too with 3 rotis and a mango! I hop onto the bus and begin our journey to Haldwani. Buses meant for Dharchula and Munsiyari have a stiffer suspension than the rest and the driver trying to make up for lost time, sent us bouncing inside the bus. We reach Almora in the evening and stop at the usual stop for Dharchula bus where the driver changes. I de-board to buy a piece of Singhori and some for home. These won’t last long, but is delicious and comparatively less sweet, with good flavor. UTC buses do not have music systems, so each driver carries his own medium. Accordingly the new driver starts setting up his music system. The regular route to Haldwani is open now, which meant I don’t have to pay extra. It is getting cold and I feel slightly feverish. By the time we reach Haldwani, the fever has settled in and I am in no mood to have dinner have bananas instead. Driver switches on his collection of old Hindi songs. I am in good mood and spirit, but feeling fatigued. By the time we cross Rudrapur, the fever turns in to a headache. Thankfully sitting in the front ensured I don’t feel too many bumps between Rudrapur and Rampur. Around Gajraula, the worst part of traveling in UTC regular buses resurfaces. The bus drives almost a kilometer on the wrong side, in order to reach Shivam tourist dhaba. I hate this place! There is no water in the toilet, so everyone has to use the hand pump in front. I didn’t spend a single rupee here and waited outside the bus. We reach Delhi around 4 AM. I order an Uber and head towards home. The headache is still on and after eating food, I decide to hit the bed, instead of working on the travelogue. But there is a smile on my face, I have managed to reconnect and reestablish my beliefs. Though search for the unknown continues, I am confident; I will find what I am looking for! 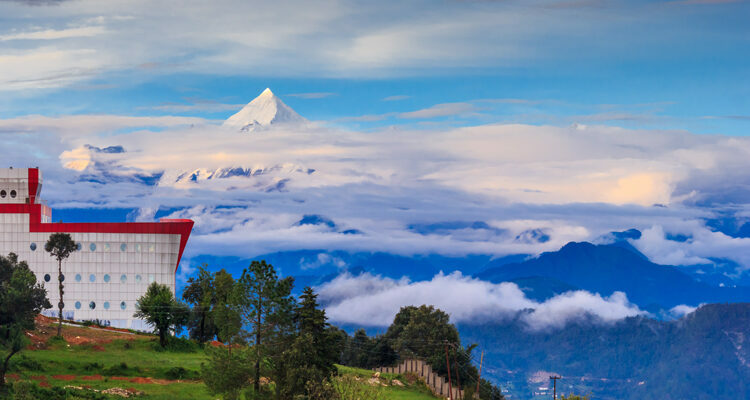 Chaukori is a hill station, surrounded by the towering Himalayan peaks in the Pithoragarh district in the Kumaon Division of Uttarakhand. The closest railhead is 198 Kms at Kathgodam. STAY: There are cottages available here where one can stay and enjoy the serene surroundings.